A new style of pizza that’s growing in popularity for its presumed ‘healthiness’ is definitely the Salad Pizza. Just imagine a salad on top of a thin pizza. Popular greens on these salads include spinach and arugula which are topped with tart vinaigrette. This asks for a wine with even more tartness and ‘green’ flavors such as Awaken Sauvignon Blanc, crisp and refreshing with notes of citrus grapefruit and tomato leaves. 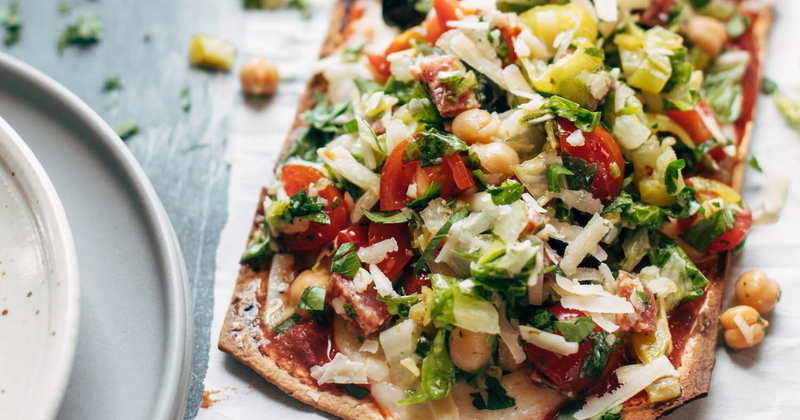 A tangy Italian chopped salad on a crispy flatbread pizza with tomato and mozzarella, aka Chopped Salad Pizza. My favorite food this summer! Salad: Chop all your salad ingredients and toss with some dressing. I like when it has a little time to sit and marinate together in the dressing. Assembly: Top the pizza with the salad. Cut and serve. Yummy! This recipe makes quite a bit of dressing, so you’ll probably have some leftover – which is fine by me because it goes well with just about everything.